The little boy, who is now four and a half years old, seems very keen and interested in musical instruments and I finally got my act together and found him not one but two piano teachers! The lesson at home is a little more casual. The teacher more motherly or rather, grandmotherly! The teacher who comes to our home is my niece's teacher. At the present moment, he seemed ok with both and we will see how he progresses. In addition, one is on an electronic piano at home and the other on a baby grand in the school so he gets a feel of different types of piano and I do like the variety. 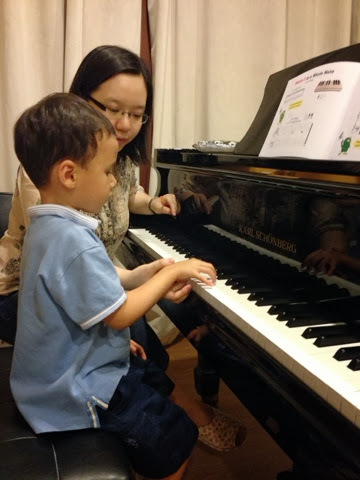 Here a shot of today's lesson time with his teacher correcting his hand's shape on the keys.